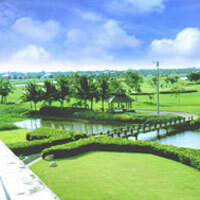 The Thanont golf course in Bangkok is one of only a handful of Bob Mcfarland designed golf courses in Asia. Water surrounds almost the entire golf course and the course while basically flat has a very interesting layout. There is challenge for the accomplished golfer as well as relief for the less skilled. This course will provide a fair and pleasurable round of golf to golfers of all abilities. Most holes require strategy on each shot to score well.